The 6' x 2'6" Value Overlap Pent Storage Shed provides a great storage space for any garden. Its overlap cladding provides a rustic exterior and the framed double doors provide optimum accessibility. The Overlap Pent Storage Shed is delivered with a basecoat treatment to help protect it during transit. It is recommended however that you treat the pent storage yourself with a high-quality preservative for maximum protection against the elements. Review:Good quality great value easy to assemble. Our Reply:Good morningThank you for taking the time to leave your feedback today. We take all feedback very seriously and it is good to know that you are happy with your recent purchase. Our Reply:Good morningThank you for taking the time to leave your feedback. We take all feedback seriously and it is good to know that you are happy with your new garden building. Review:Great service delivered on time! Review:Shed exactly what required for my Mum.Delivery quick and Driver helpfully put shed in Mums rear garden. When erected all good! It is great that you are pleased with the quality of your overlap shed and that it is exactly what your mum required. Thank you again for your positive review. It is wonderful that you are happy with the quality of your overlap shed and I thank you again for your much appreciated review! I am so glad to learn that you are happy with the quality and value for money of your overlap shed and I thank you again for your great review. Review:Not waterproof. Leaks, despite being installed by a professional handy man. The material supplied for the top wrinkled up and looks ugly after one rain shower. Review:Good quality shed and great service! Great to hear your Overlap Modular Pent Storage Shed is good quality, we hope you enjoy using it. I am pleased to know that you are happy with your overlap shed and I thank you for your feedback. Review:cheap and practical storage for the garden. Thank you for letting us know you're pleased with your Storage Shed and find it good value for money. Review:Good value for the money. It is great to know that you are happy with the value for money of your overlap shed and I thank you again for your feedback! It is great to know that your overlap shed suits yours needs perfectly and I thank you again for your much appreciated feedback. Review:The shed itself is fine and was easy to construct. They only problem is that the bolt doesn't work- the shed can still be opened even when padlocked. I hope Waltons will be able to do something to rectify this? Review:Good product and good price very pleased with it all. It is great to know that you are pleased with the quality of your overlap shed and I thank you again for taking the time to leave your positive feedback. Review:Exactly as ordered, only minor glitch and it my personal preference I would have preferred the doors on the shed were not varnished/stained as the dark stain i used kinda looks a bit weird and yellowish but then that might just be me! Thank you again for your great feedback and I am happy to know that you are pleased with your overlap shed! Thank you for your feedback and for taking my call earlier please accept my apologies again for the issue you experienced with your order. As discussed we will resolve this as quickly as possible for you. I am delighted to know that you are so pleased with the service provided and with the quality of your overlap shed. It is great to know assembly was straight forward and that your shed is perfect for your needs. Thank you very much for your great review! Review:Good quality summer house and shed. 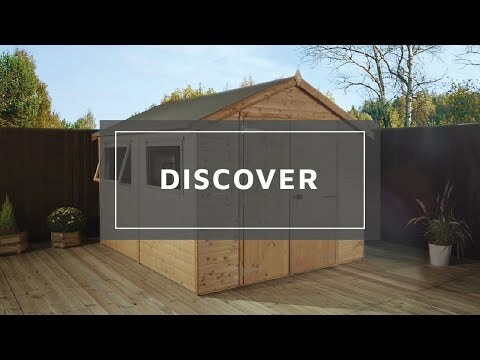 It is wonderful to know that you are happy with the quality of both your summerhouse and overlap shed and I thank you again for your great review! I am delighted that you are so happy with the service received and the overlap shed you have purchased. Thank you for providing is with your great review and it is great to know you would recommend us! Review:Good enough for purpose overall but base very flimsy (I added heavy timbers to raise it off the ground more and to stiffen it). Overlaps of cladding inadequate as rain came through the joins - with a bit of help from a stiff breeze. But it will do the job! Our Reply:Thank you very much for your review. Our Reply:Thank you for your kind comments and recommendations - greatly appreciated.